Some Hong Kong appraisal firms subcontract North American appraisal work to me. The work is for financial reporting purposes, as the property owners are publicly traded firms, and I have gotten used to the writing reports in compliance with the Hong Kong Institute of Surveyors. On January 28 I was asked to bid on an appraisal of Oceanwide Plaza being built across from Staples Center, a leading sports and concert venue in Los Angeles. Oceanwide Plaza had just topped out with three towers of 40 or more stories. This was said to be a $1 billion project. I was surprised by this request because just the previous week, Lendlease, the Australian general contractor, had rocked the LA real estate world by announcing that it had halted construction on Oceanwide Plaza. The interior remains to be built. There were rumors that the lender had pulled out of the project, but no explanation of why. In November 2018 the FBI served a search warrant to China Oceanwide Holdings in an investigation of local public officials and Chinese developers regarding bribery, extortion , money laundering and kickbacks relating to 4 prominent Chinese real estate developers, including China Oceanwide and Greenland Group (developer of the new Metropolis condominium/hotel project nearby). No charges have been filed against China Oceanwide or the others. A press release from China Oceanwide explained the need for capital restructuring and that construction would resume in February. With my own eyes I saw the project still stalled as of March 18, 2019. 1. Chinese capital controls, instituted two years ago, are preventing the necessary funds from leaving China. The purpose of the new regulations was to reduce “irrational outbound investment and to improve the development of China’s overseas investment.” China has been attempting to crack down on capital flight resulting from a slowing economy and downward pressures on the exchange rate. These same controls have caused other Chinese developers to place their North American assets for sale. Greenland, developer of a similar project called Metropolis, a few blocks north of Oceanwide Plaza, has placed one of their three residential towers plus their Indigo hotel for sale. There seems to be a pattern here of Chinese developers now placing their properties for sale, as Dalian Wanda sold its unbuilt One Beverly Hills project (valued at $444 million) last November, and Oceanwide itself placing its unbuilt 80 South Street project in Manhattan for sale for $300 million after buying it for $390 million 3 years ago. Meanwhile, the Chinese government has seized the insolvent Anbang Insurance Goup and will be selling off its U.S. hotel assets, acquired for $7.45 billion during 2014 to 2016, which includes the Waldorf Astoria Hotel in New York, which itself cost $1.95 billion. 2. Lack of buyers. As local realtors speak of the residential sales slowdown at the Metropolis, the same forces may be working against Oceanwide Plaza. One realtor said that 60% of the residential sales at the Metropolis were to Chinese buyers who did not intend to occupy their units. A Chinese-American bank even asked me to appraise one of the units as a rental property, and I told them that if 60% of the units are placed for rent at the same time, there is no way of estimating how far market rent would fall. Downtown Los Angeles already has a 17% residential vacancy rate, the highest vacancy rate since the 1990s. Capital controls could be affecting these Chinese buyers, too. Some say their main reason for purchase was to remove capital from China, either because they do not trust their own government or perhaps to place ill-gotten gains away from capture. 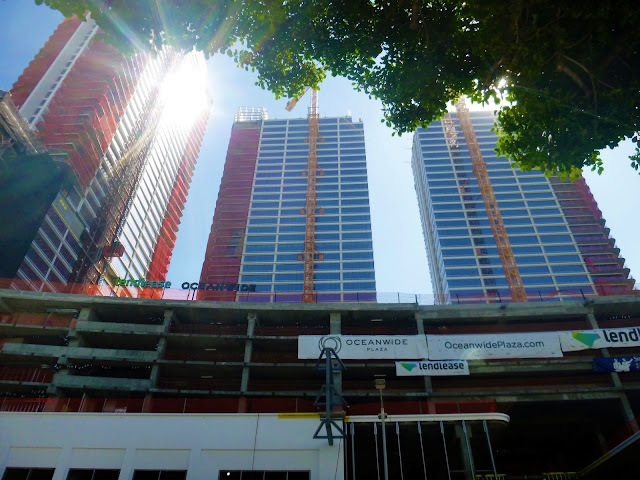 More news came out in February about $62.5 million in mechanic’s liens on Oceanwide Plaza, but more intriguing was some private correspondence from general contractor Lendlease to some of its subcontractors, stating that Oceanwide “had failed to maintain the minimum contractually required payments for both your and our work”, yet Lendlease, with an $814 million construction contract, had not filed any mechanic’s lien yet. Looking at the bigger picture, the Chinese capital controls law passed two years ago will be starting to affect certain North American real estate markets, such as Los Angeles, San Francisco, Vancouver and New York, which have been highly boosted by Chinese investment. The Chinese government measures net capital flow to the United States, which has been profoundly positive for a few years, but in the last quarter of 2018, the net capital flow was a huge $54.6 billion outflow of capital back to China. Forbes Magazine estimates that China has lost $3.8 trillion to capital flight during the last decade. They want their money back. One expert estimated that the ratio of outbound Chinese capital (back to China) to inbound capital is about 10 to 1. 3. Or in the worst case, if building and safety laws were allowed to be violated, Oceanwide Plaza could end up being 3 decaying 40+ story hulks sullying the downtown L.A. skyline. I told the Hong Kong appraisal firm that they should ask to be paid in advance, which is not the custom in this type of financial reporting work. They replied, "Noted, with thanks".